La Gaule sous l'Empire Romain. 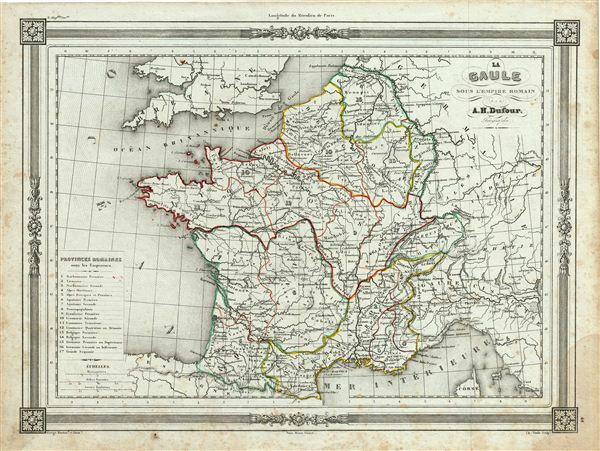 An uncommon and extremely attractive 1852 map of Gaul or France in ancient Roman times. Covers from the southern part of england (Britannia) to the north of Spain and the Mediterranean. An inset in the lower left corner details 17 provinces under the Roman emperors. Throughout, the map identifies various cities, towns, rivers and assortment of additional topographical details. Gaul was the ancient name of a region of Western europe which comprises of modern day France, Luxembourg, Belgium and Germany west of the Rhine. It also included most of Switzerland, the western part of Northern Italy and parts of Netherland. After the Gallic Wars of 58-51 BC, all of Gaul came under the control of the Romans. It continued to remain under Roman control for almost 500 years before it fell to the Franks in AD 486. The Gallic Wars are believed to have been fought primarily to provide Caesar with wealth and popularity and to boost his political career rather than being a defensive action as described by Caesar. The campaigns are described by Caesar in his book Commentarii de Bello Gallico. The map features a beautiful frame style border. Prepared by A. H. Dufour for publication as plate no. 44 in Maison Basset's 1852 edition of Atlas Illustre Destine a l'enseignement de la Geographie elementaire.